In the United States, a gender gap both in achievement and retention in science continues to plague science educators. Over the last decade, a variety of strategies to close this gap have been proposed—encouraging girls to take more science classes, providing scholarship programs, mentoring promising students, and designing special programs for girls. These strategies have defined the problem as increasing girls’ interest and survival in science classes and careers. Although the achievement gap between boys and girls has narrowed, simply improving access girls’ access to science has not solved the problem totally (Shaw, 1995; Walkerdine, 1998). By focusing specifically on girls these initiatives perpetuate the myth that girls are less capable of doing “real” science and require special programs designed for them. For example, the science education research literature has determined that girls do not use tools exactly the same way that boys do and concludes that to be successful in science girls should have more opportunities to tinker with tools like boys. I suggest that it would be more fruitful to look at the multiple ways that boys and girls do science. Focusing on the differences between girls and boys does not take into consideration that children engage in science in multiple and context dependent ways. 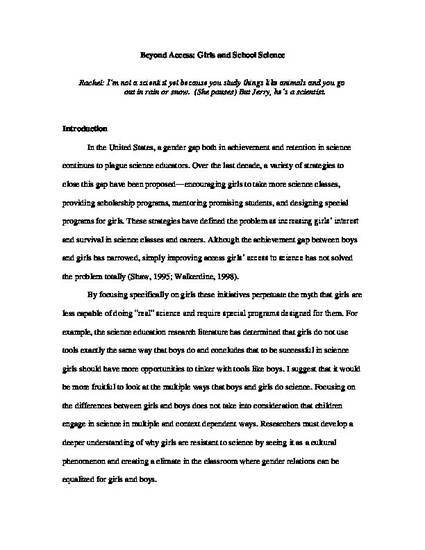 Researchers must develop a deeper understanding of why girls are resistant to science by seeing it as a cultural phenomenon and creating a climate in the classroom where gender relations can be equalized for girls and boys. Emilie and Lizzie showed me by their words and actions what they mean by “caring.” In one sense they were performing gender by their conversations and behavior. Their actions were also performative of larger Western cultural ideas of how one cares for animals. Analyzing social discourse in this way shifts the responsibility for social change from a focus on the individual’s behavior to the social and cultural institutional structures that create, replicate, or constrain individual behavior. I spent one school year interviewing, observing, and conducting my own science research sessions with eighteen 7 and 8 year olds (eleven girls and seven boys) as they engaged in “hands-on science” in a suburban classroom north of Boston. In this classroom the children “did science” by sorting and classifying objects, measuring with available tools, identifying and accurately naming animal behavior; and experimenting with water, sand, and small animals. The pedagogy in this science classroom represents the best practices for teaching. Science educators believe that science knowledge does not come from the objects themselves but from the ideas generated by the student’s manipulation of objects. This way of teaching science encourages interaction and conversation between the teacher and the students and among the boys and the girls. Researchers of gender equity believe this pedagogy allows the classroom teacher to hear the boys’ and the girls’ emerging science ideas. In my observations I heard the student’s ideas, which often included gendered responses to the science activity that were not usually expressed in front of the teacher.